eDimensional Premium EIGHT PACK STORAGE CASE for your active 3D Glasses with 8 Microfiber Cleaning Cloths for 3-D glasses with foldable arms. Designed for use with both Standard Active 3D Glasses and DLP Link 3D Glasses. Shown in pictures with eDimensional Active 3D Glasses and Ultimate 3D Heaven DLP Link 3D Glasses (3D Glasses Not Included). FINALLY a ZIPPERED 3D Glasses Storage Case with Superior Quality for a reasonable price. Prior to now 3D glasses storage cases were lower quality, did not provide good protection and were overpriced. 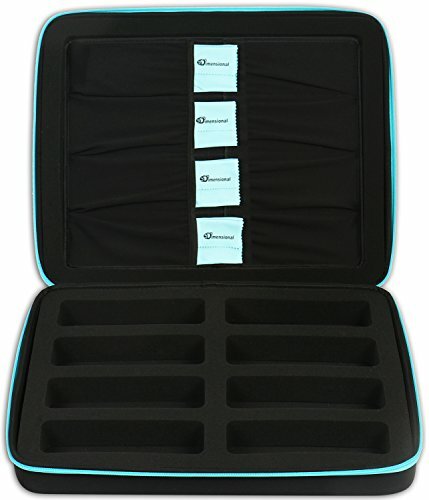 eDimensional's 3D glasses storage case solves all of these issues - our 3D Glasses storage case includes premium quality materials including a softer durable foam to better protect your glasses - our 3D Glasses storage case is also taller to better protect your 3D Glasses. GREAT VALUE - Much Better Quality than Similar Cases at a Better Price! PROTECTION - Superior Protection for EIGHT Pairs of 3D Glasses. EXTRAS - Comes with 8 Microfiber Cleaning Cloths COMPATIBILITY - Fits All Major Brands of 3D Glasses with Foldable arms. PORTABILITY - take your 3D glasses with you or safely store them when not in use. GREAT VALUE - Much Better Quality than Similar Cases at a Better Price!